If you talk to any process management or BPM vendor, they are likely to tell you that one of their biggest challenges is access to the C-Suite. This is because many executives fail to understand that process management is actually a valuable tool to help them and their organization perform better and mitigate risk. I would suspect in most scenarios, that at least one individual within the organization would have suggested introducing a process management system. It can be concluded that if fiduciary, regulatory and compliance issues are a boardroom issue, surely so must be the responsibilities for the processes that deliver or support them. Process Management is not only about risk management and cost avoidance. It is about revenue generation and the creation of new innovative business models. I’m unaware of many C-level executives who delegate the role of strategy development and business models to mid-level managers. New models and strategies inevitable mean rearranging and managing processes. This is not to suggest that every C-level executive should be an expert in process or involved in every aspect of change management. They need to think about how they discuss process, if they are seen spending time on it, and if they ask process-related questions. If they do, everyone in the organization will understand the value or process and prioritize such responsibilities. One example is how people change their behaviour based on what they see and hear from boardroom executives. Several years ago, I was asked to deliver a workshop and presentation to introduce value concepts. The audience was intended to be a select group of 30 managers, which ultimately changed after the CEO agreed to send out an email notification to his entire team. Within the email, the CEO explained why process was important to him and his organization. It was not the words that made the difference, it was the action behind the words. As a result, our boardroom presentation was moved to an auditorium. We also found ourselves with many additional people frustrated that they were unable to join later workshops due to the overwhelming response. In the final analysis process management is useful for cost avoidance, efficiency, risk management, compliance and a whole host of topics that should belong in the boardroom –very few of us do what we should do! How many C-level executives aren’t interested in sales increase, creating new revenue streams, bringing new products or services to market faster, better management of mergers and acquisitions, or exploiting new market opportunities? These are all examples to excel a business into exponential growth while protecting from the unexpected. 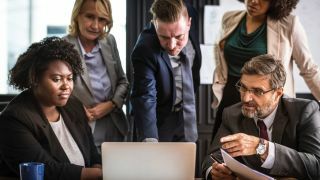 As a C-level executive, I would suggest that other C-level executives take more involvement into their organizations process management initiatives. Mid-level managers need to promote the positive elements, while vendors focus on the business benefits of process management rather than the features. For all groups, the perfect product to fix your organizations “pain points” does not exist.